The Ichimoku Kinko Hyo forex trading strategy is an easy to use strategy that employs the IchimokuKinkoHyo.ex4 indicator. This strategy is therefore based on the native version of the Ichimoku Kinko Hyo indicator, but with a difference. Here, the signals have been simplified so that traders get clear buy and sell signals without trying to make sense of the 6 components of the Ichimoku Kinko Hyo. Recommended Trading Sessions: This strategy performs maximally during the London and New York sessions. The strategy works by showing the bias of the market for the currency pair: green for a bullish bias and red for a bearish bias. The strength of the bias is also displayed, and the entry and exit areas are marked by the indicator on the price action for the trader’s benefit. The sentiment has to be very bullish (at least >60%). On our chart example, it is 100% bullish. There must be a green cross hair signal on the candle in view. This means that a horizontal and vertical grid line must appear on the entry candle. In this example, this is the candle on which the BUY 1 signal appears. Enter long at this candle’s open price, and also look for possible long trade re-entries in future when price retraces to this price area. Stop Loss for Long Entry: ≥5-30 pips below the entry price. Sometimes, the indicator will show the possible areas where price will find support. The SL should be set below the nearest support level. 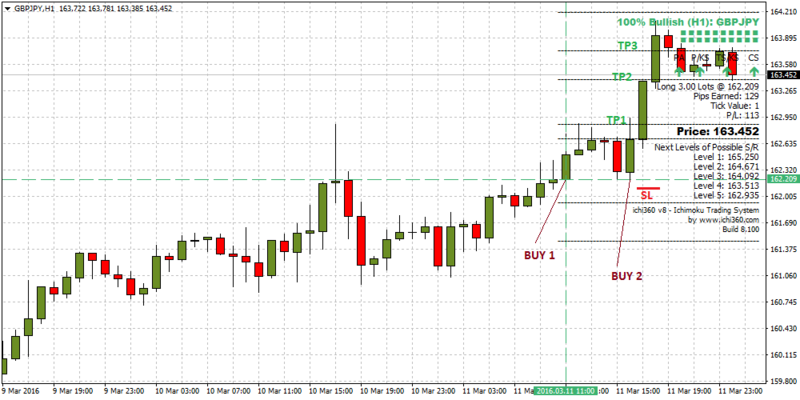 The nearest resistance TP1 is used as the first profit target. If price action is very strong and breaks this point, set a trailing stop to follow the price to TP2. 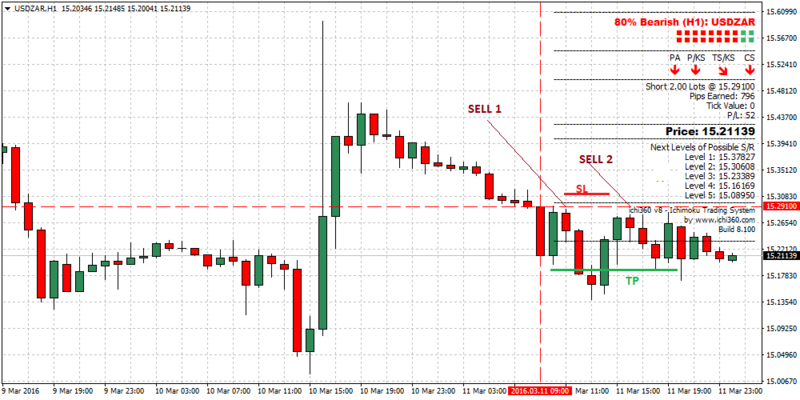 If price breaks TP2, use a trailing stop and try to achieve TP3. The sentiment boxes will show a predominantly red colour, which is bearish. Sentiment must be at least 60%. In this example, it is 80% bearish. A red cross hair signal appears on the 1st entry candle. Go short at the open of this candle. The open price can also be used for re-entries in future if price falls to this area (SELL 2). Exit Strategy/Take Profit for Sell Entry: The indicator will also indicate at what prices the currency pair will likely find support. This is the TP level. Set the TP to the nearest support level. If this line is broken, then use the next support below as the 2nd TP area. Ordinarily, the Ichimoku Kinko Hyo indicator is a complex indicator which many traders find confusing to use. The IchimokuKinkoHyo.ex4 indicator has simplified the process. Simply use the indicator as shown to make precise entries and exits.